The precious Puy Lentil had better watch out, its delicious Italian cousin, the Lenticchia di Santo Stefano (lens culinaria) is soon to be awarded DOP status and the 12 farmers that grow this nutty mini lentil will hopefully be recognised globally for their cultivation of this very tasty legume. Lentils do tend to thrive in challenging habitats and this couldn’t be more so – 1000 masl on the harsh stony slopes of the Gran Sasso Mountains, fortunately lovingly watered from the melted snows and springs. Particularly rich in iron this dark brown lentil has the thinnest rough hull – part of the reason for its tenderness, which is first noted in monastic documents in the C10th. 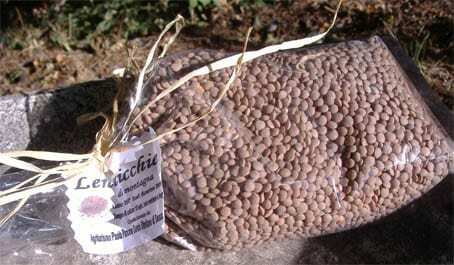 The small town of Santo Stefano now celebrates these lentils with their famous “Sagra delle Lenticchie” festival. If you are holidaying in Abruzzo the first weekend in September do try and pop along – you’ll get to try a hundred very tasty lentil dishes. Chop ¾ of an onion, & 2 cloves of garlic finely chopped. Add 2 sticks of finely sliced celery. Fry gently in a good glug of olive oil. Add 1.5 mugs of good lentils. Cover mixture with water and a ‘delicado’ stock cube. Add a good sprig of rosemary and bring to the boil. Add 1 packet of air-dried chestnuts quartered. Simmer for 20 minutes adding more water as necessary. Roast 4 pork & veal sausages (90% minimum meat). Chop 8 slices of prosciutto. When lentils are cooked with enough water in pan to still be a ‘soup’ add sausages and prosciutto & salt & pepper to taste. Leave to stand for 1 hour and warm gently to serve. Always roast Abruzzo sausages – although they taste wonderful part of that comes from the grasse (fat). Traditionally they would always be grilled to accompany the meat which helps reduce the fat content – they really don’t work fried. Reference – what is DOP? D.O.P./P.D.O. (Denominazione d’Origine Protetta / Protected Designation of Origin) is a definition by the European Union and is connected with the specific geographical area that defines the quality, taste and other singular characteristics of a particular product – think Feta Cheese, Gorgonzola etc etc. hi ami, do let me know what you think of it and i will pass any compliments or recommendations onto Italia who helped invent it. The chestnut part comes from some wonderful soup we had once in a little cafe in Rome on a very cold winter's day but which made us leave with big smiles on our faces, hope it does the same for you .